File Name: Andrei Freisov of Moscow, Russia, USSR. Notes: Moscow is the Russian capital, near the west end of the country. To my knowledge, Dragonsky was never animated. 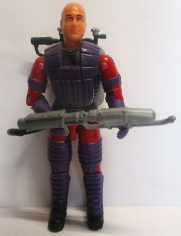 Accessories: silver flamethrower (05 Dreadnok Torch's), black helmet with metallic blue visor and grey trim (93 Blast-Off's), dark green backpack with black hose (05 Dreadnok Torch's), clear red flame (05 Dreadnok Torch's), clear figure stand (common). ANDREI "DRAGONSKY" FREISOV is a member of the OKTOBER GUARD (Russian/Warsaw Pact equivalent of the G.I. JOE Team) and an expert with special weaponry, including his favorite—the flamethrower. His interest in fire control and the military started at an early age. As a child, he was seen throwing Molotov cocktails at German Panzers when they invaded his homeland. He later joined the Soviet Army and had a long and successful military career. His greatest honor came with the invitation to join the elite OKTOBER GUARD. 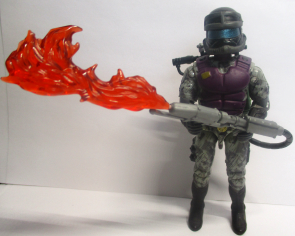 Dragonsky carries the latest in military pyro-technology and wears a special flame-retardant suit. He is a very dedicated and loyal individual, always ready to protect his comrades even when the odds are against him. Early in Dragonsky's military career, he was trained by a brilliant commander who later proved to be insane and immoral. Because he failed to turn him in when he had the chance, the OKTOBER GUARDSMAN has made it his personal responsibility to someday bring down the madman. Even though his personal nemesis now goes by the name of "GENERAL MAYHEM," the brutal tactics are all too familiar to Dragonsky. It is to this end that he seeks the assistance of the G.I. JOE Team in capturing GENERAL MAYHEM for his crimes against the "motherland." "Even in Siberia, I make sure things get really hot!" 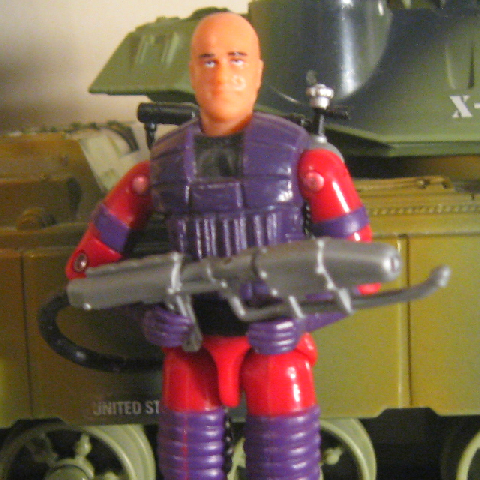 Toy Notes: Carded in a convention-exclusive three-pack with Gung-Ho and Steel Brigade Commander. This figure is considered a high-demand item. Accessories: black rifle (02 Neo-Viper's), silver flamethrower (05 Dreadnok Torch's), silver backpack with black hose (05 Dreadnok Torch's). "Whenever the enemy tries to make the situation hot for me, I make it ten times hotter for them. Toy Notes: Carded in a three-pack with Lt. Gorky, Sgt. Misha Zubenkov, and a reprint of Marvel #101. Item #13025.